Citation Information: J Clin Invest. 2005;115(2):434-442. https://doi.org/10.1172/JCI18452. Regulation of the immune response requires the cooperation of multiple signals in the activation of effector cells. For example, T cells require signals emanating from both the TCR for antigen (upon recognition of MHC/antigenic peptide) and receptors for costimulatory molecules (e.g., CD80 and CD60) for full activation. Here we show that IgE-mediated reactions in the conjunctiva also require multiple signals. Immediate hypersensitivity reactions in the conjunctiva were inhibited in mice deficient in macrophage inflammatory protein–1α (MIP-1α) despite normal numbers of tissue mast cells and no decrease in the levels of allergen-specific IgE. Treatment of sensitized animals with neutralizing antibodies with specificity for MIP-1α also inhibited hypersensitivity in the conjunctiva. In both cases (MIP-1α deficiency and antibody treatment), the degranulation of mast cells in situ was affected. In vitro sensitization assays showed that MIP-1α is indeed required for optimal mast cell degranulation, along with cross-linking of the high-affinity IgE receptor, FcεRI. 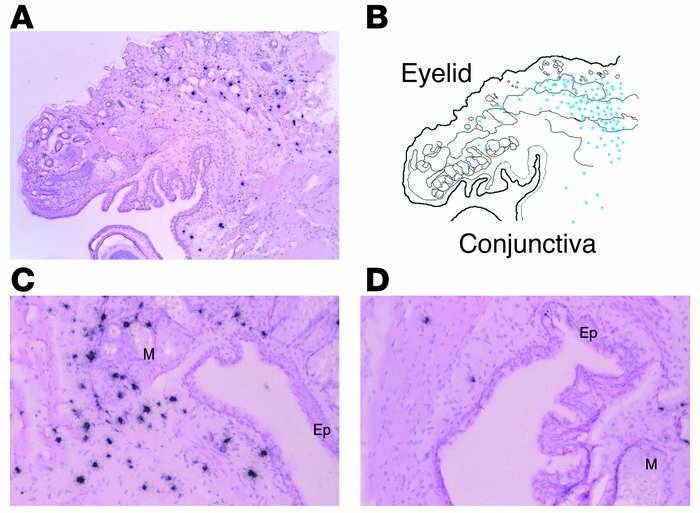 The data indicate that MIP-1α constitutes an important second signal for mast cell degranulation in the conjunctiva in vivo and consequently for acute-phase disease. Antagonizing the interaction of MIP-1α with its receptor CC chemokine receptor 1 (CCR1) or signal transduction from CCR1 may therefore prove to be effective as an antiinflammatory therapy on the ocular surface. Location of MIP-1α–expressing cells in the allergen-challenged conjunctiva. (A) Localization of MIP-1α mRNA-positive cells in the allergen-challenged conjunctiva. Slides were exposed for 4 days, developed, and counterstained with H&E staining. (B) Schematic description of conjunctival mast cell distribution. Note colocalization with MIP-1α–positive cell distribution as shown in A. (C) MIP-1α mRNA-positive cells were also shown in the tarsal conjunctival area of allergen-challenged mice (3 weeks exposure). (D) MIP-1α–positive cells in PBS-challenged conjunctiva (3 weeks exposure). Ep, conjunctival epithelium; M, meibomian gland. Magnification, ×40 (A), ×200 (C and D).